I’m finally giving in to the fact that winter is looming closer, it’s suddenly got pretty cold and made me realise I really need to update my wardrobe to include some more suitable clothes and accessories. Out with the vest tops and in with the wooly jumpers! So, what’s the first item to be added to my winter wardrobe…?? The boots are made from a black faux leather, with an almost suede effect. 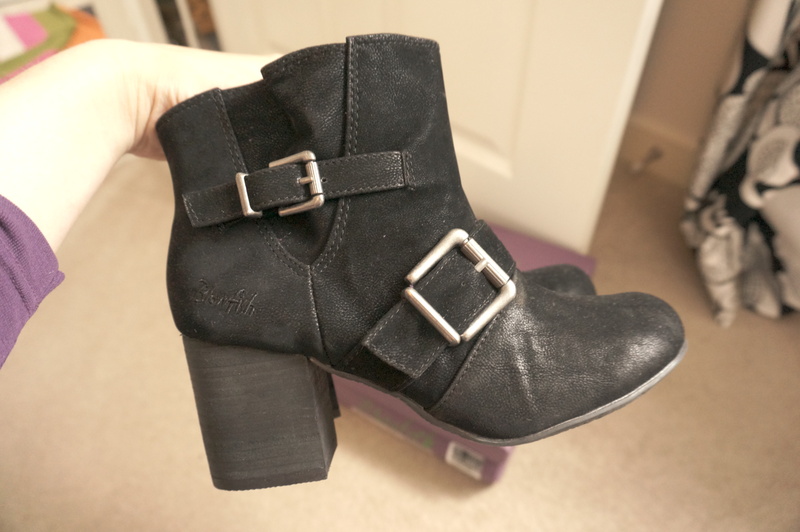 They have a stacked style heel and lovely silver buckle details. These are the perfect day to day boots for me, they offer a bit of height but are very comfortable to wear and easy to walk in, and pretty much go with anything. The boots came from MandM Direct, they were originally £54.99 reduced to £24.99, how awesome is that! MandM Direct have loads of big brand names with fantastic discounts. I have my eye on this lovely Firetrap cardigan next! I’d love to hear what items your buying to add to your winter wardrobe? Next Post Blogger FAIL Photo Collaboration!